Kaida Snowshoe Trekking（開田スノーシュートレッキング）is a popular winter activity in Kiso, Nagano Prefecture. You can rent snowshoes at Kaida Visitor's center and walk around the Kiso Uma no Sato, the stable. It takes 60 to 90 min. Kaida in winter has a lot of snow in winter. Therefore, you can enjoy walking on a deep powder snow. It has a great view of Mt. Ontake. Also, you can see Japanese Horses at the stable. Rental cost: 1,000 yen for a day. 1. use local bus to Kisoumanosato iriguchi. Kaida Highland Snowshoe Trekking is a great winter activity in Kiso, Nagano Prefecture. Kaida Highland has a lot of snow in winter. During the winter, Kaida Visitor's Center rent snowshoes. 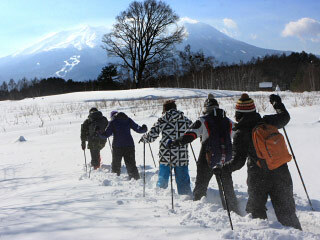 The course for snowshoe walking is located around Kisoumanosato that is 5 min. from the center. (Note: don't put the snowshoes on the street. Put them on snow at starting point. ) You can get a map for the course. It is about 1.5km long and takes 60 to 90 min. Note: don't enter the stable. Keep your course according to the map. Price: 1,000 yen per day.